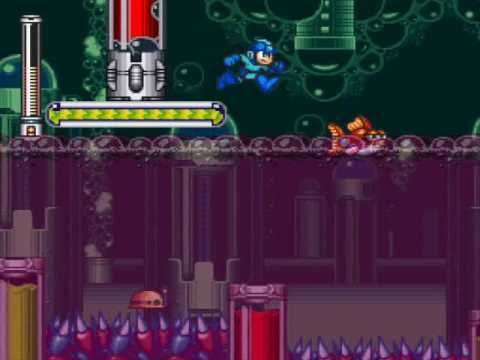 Does Mega Man have enough left in the tank for a seventh installment? It took three years, but finally, in 1985, Classic Mega Man made the jump to the Super Nintendo. After six installments on the original Nintendo Entertainment System, fans were feeling a bit tired of the formula. Does the jump to new hardware give Mega Man 7 the breath of fresh air the series needed? Right off the bat you'll notice something different about the story in Mega Man 7. Mainly that there actually is one this time, and it's not simply tucked in a manual either. The into sequence starts off with Mega Man, Roll, and Dr. Light's new assistant Auto driving into the city, which is in ruins. Mega Man arrives just in time to see Dr. Wily's new batch of robot masters free him from prison before he flies off once again, leaving Mega Man to track him down and put an end to his nefarious plans. Along the way Mega Man also encounters a strange new robot named Bass and his canine companion Treble, (real subtle Capcom), who seems to want to stop Dr. Wily as well. Could this new rival have other motivations as well? The story isn't anything mind-blowing, but it is nice to see a greater effort went into in this time around. 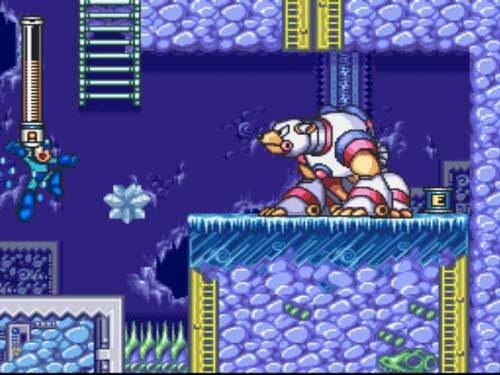 Even with the jump to a 16-bit system, the core gameplay of the series remains the same in Mega Man 7, for better or for worse. There are still 8 robot masters to destroy, you still gain their weapons upon defeating them, you can still charge your shot, you can still slide, Rush returns to help you out once again, everything that you would expect in a Mega Man game. One thing that did not return this time around is the Power and Jet forms found in Mega Man 6. 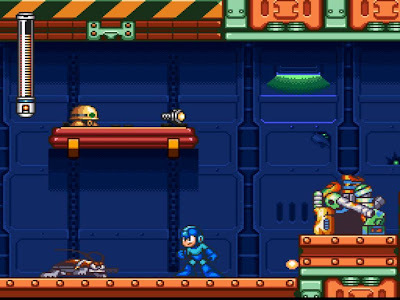 They are instead replaced by the Super Adapter which can be gained by collecting four plates hidden in the levels that spell the letters R-U-S-H. New to Mega Man 7 is Auto's shop which can be used to purchase various items and upgrades. Currency is found all throughout levels in the form of bolts, and can also be gained from defeated foes. The interesting thing about this system, is that much like Mega Man X, many of the items can also be found in the levels themselves, meaning that you never need to buy anything from the shop if you're good enough. That also brings about one of the game's faults though. The problem with hiding the items in the levels comes from the fact that they're nowhere near as well hidden as the aforementioned Mega Man X. If you don't want to hunt for the items, they can be purchased, but the prices are often ridiculous and you're better off trying to find them for yourself. 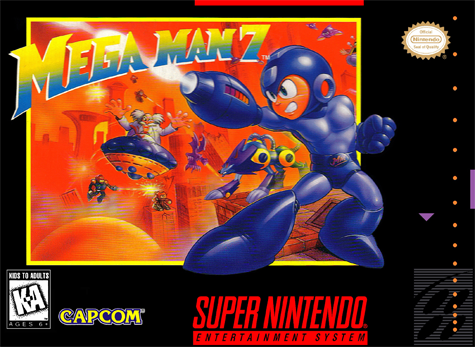 Mega Man 7 plays fairly conservative, so if you were a fan of the previous games you'll feel right at home. If Mega Man was never your thing, Mega Man 7 probably won't change that. In terms of overall difficulty, Mega Man 7 is on the easier side. It has it's challenging parts, but it feels more forgiving than the earlier games. The final boss is an exception to this however, and is easily the hardest in the entire series. Unfortunately this is where the positive aspects stop and I address the problems with this game, and there are quite a few. Let's start with Mega Man's sprite. As you might have already noticed, it's quite a bit larger than in the NES games and though it might be a minor change, it makes hazards and enemies harder to see because of it. If you can ignore that small detail though, that brings us to the problem of the level design. The level designs feel much more standard this time around, and in certain cases downright frustrating (I'm looking at you Turbo Man). There are exceptions, but the majority of the stages just aren't that fun to play. Combine that with the fact that you'll most likely be revisiting them either to farm for bolts or track down upgrades and you have a game that feels far more tedious than it needs to be. Mega Man 7 is just what the series needed to freshen things up when things were starting to get stale. It's not perfect by any means, some issues can be quite infuriating, but the strong gameplay the series is known for makes up for the stumbles. If you felt worn out after Mega Man 6, you should definitely give Mega Man 7 a try. I meant to review this game a while ago, but the holiday season has kept me pretty busy. Maybe like Mega Man 7 did for it's series, this review with breathe some life back into the site.